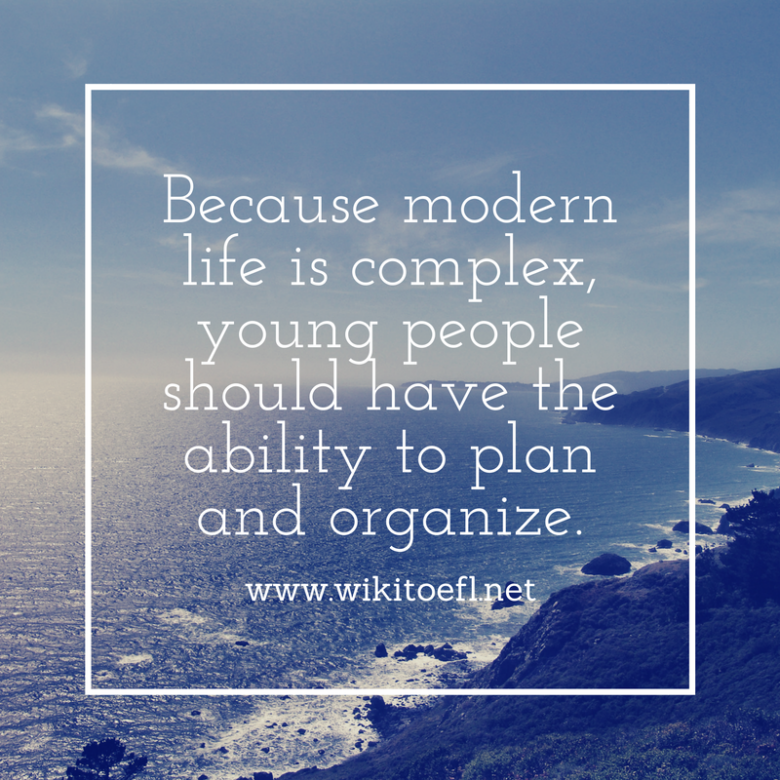 Because modern life is complex, young people should have the ability to plan and organize. Today, many young people manage their time poorly, yet they do not seem to care about that. I feel their attitudes are mistaken. On account of the complexity of modern life, even young people need to be able to plan and organize well. For one thing, being able to plan for the future is needed to get work done. People should be aware of both short-term and long-term planning. This dual planning system will help them do their work on time. For example, my literature teacher assigned a huge research paper a month before it was due. I planned ahead for it, so I made sure I had plenty of time to finish. However, most of my classmates did not plan ahead, so they were stuck writing a twenty-page paper two days before it was due. Naturally, their papers, and grades, were poor. Had they known how to plan for the future, their work would have been better. Additionally, being able to organize one’s life will make a person more efficient. Organizational skills definitely let a person save time and do more work faster than before. My parents have always tried to make me more organized. They claim it saves time. That is true. I organize my daily routine between school, homework, chores, and leisure time. I make sure I do each activity for a certain amount of time every day. Thanks to my organizational skills, I waste no time watching too much television or engaging in other useless activities. This has made me much more efficient. Young people really need to ensure they know how to plan and organize their lives. This will let them do all their work on time and help them become more efficient people. Planning and organizational skills are a must in modem life.